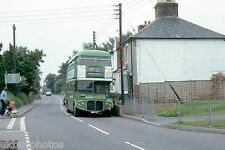 BUS COLOUR SLIDE OF A LONDON TRANSPORT DOUBLE DECKER TROLLEYBUS. THIS 35MM SLIDE IS IN NICE CONDITIO N OF HYM812,1812 SEEN IN 2012. THIS SLIDE HAS A YELLOW EDGE ON THE LEFT HAND SIDE AS SHOWN. Images are despatched in card backed envelopes twice a week. BUT ONLY IF YOU AWAIT OUR INVOICE. Another quality print from a collection kindly made available to us to raise funds for vehicle restoration projects. THIS 35MM SLIDE IS IN NICE CONDITIO N OF XF6. 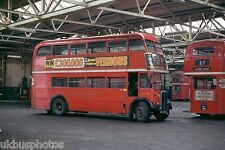 New listingBus Negative 35mm- London Country MLL 560. 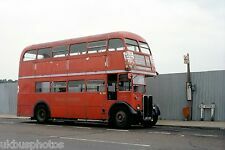 New listingBus Negative 35mm- London Country MLL 815. New listingBus Negative 35mm- London Transport NLE 815. BUS COLOUR SLIDE OF A LONDON TRANSPORT ROUTEMASTER HEADING INTO THE DEPOT. THIS 35MM SLIDE IS IN NICE CONDITIO N OF RM678. THIS DEPOT SADLY CLOSED IN JUNE 1983. BUS COLOUR SLIDE OF A LONDON COUNTRY DAIMLER FLEETLINE XF AT DEPOT. THIS 35MM SLIDE IS IN NICE CONDITIO N OF CUV56C,XF6. This is to prevent copying. I Reserve the right to use my scan. Original colour slide of Golden Miller ex-Portsmouth Weymann bodied Leyland Tiger Cub TTP997 at Feltham Station, c.1974. London Transport Leyland Titan NUW 619Y - T619. This is to prevent copying. I Reserve the right to use my scan.